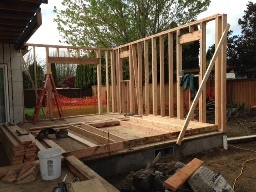 Framing has begun for the Family Room Addition Things are moving fast for the family room addition in Corvallis. Since the foundation walls were completed and passed inspection, we moved right along to start framing the addition. The placement of the new windows and patio door can be seen and a new framed wall can be seen lying on the floor deck before it is raised. The family room addition is starting to take shape. Progress of framing Next, we will continue to rough frame the walls, windows and doors and frame in the new built-in fireplace. The joists for the ceiling and roof will be added next.